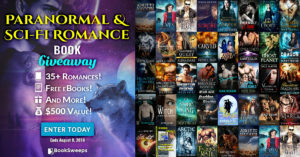 I’ve teamed up with 35+ fantastic authors to give away a huge collection of Paranormal & Sci-Fi Romances to 2 lucky winners, PLUS a brand new eReader to the Grand Prize winner! You can win my novel BONDING WITH THE BEAST, plus books from authors like Mina Carter and Christine Pope. I just finished “Planet X” & I loved it. Is there going to be a sequel?